Apart from problems with verification of exposure-response and with the general condition of outdoor advertisements due to the weather, there is one more issue that is rather difficult to control: production of tailor-made signs, floats and other objects of outdoor advertising. It is difficult to estimate the size of budget in advance and stick to it while designing and production as there are too many parameters that should be foreseen and taken into consideration. Thus outdoor advertising requires no less careful planning and estimation than other means of advertising, besides it presents difficulties in control and measurements however it is indispensable in advertising of a wide range of products and services. Outdoor advertising is still considered one of the most effective advertising methods. Thus, evaluation of its efficiency is a must for companies who invest in this advertising type. Through evaluation of cost per 1000 views manager can make budget estimates and reveal the most efficient spots for advertising banners. It might be good to evaluate ratio of outdoor advertising costs vs overall advertising budget. Download trial version of Outdoor Advertising Indicators. Purchase full version of Outdoor Advertising Indicators + bonus. Outdoor advertising forms an inseparable part of advertising as this is what sets the stage for reaching large masses of people. However, the path is studded with numerous challenges such as 'exposure level, which is questionable', 'weather conditions that can force changes in campaigns and moves', 'coming up with tailored signboards, billboards' etc. The culmination of all these factors shapes up a complicated environment to operate in. Sticking to the pre-decided suggestions can get extremely difficult and tough. Such high degree of uncertainty in surroundings makes taking thoughtful steps the 'hobson's choice'. Moving on, measurements and calculations make up another component of this domain that has to be taken care of. One can use a Balanced Scorecard for the purpose of evaluating 'effectiveness of outdoor advertisements'. The most initial step in this field of outdoor marketing is to spot the KPIs (Key Performance Indicators) capable of accurately reflecting movements and procedures. Later, values are attached to these metrics to be followed on a regular basis. By making sure that you are within the prescribed range and intervals, it is possible to take precise moves and steps in case of 'advertising in outdoor mode'. Related metrics and KPIs for: Web Advertising, Press Advertising, TV Advertising, Cinema Advertising, CD Advertising. This is the actual scorecard with Outdoor Advertising Indicators and performance indicators. 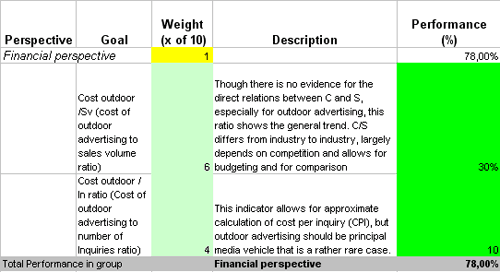 The performance indicators include: cost outdoor /sv (cost of outdoor advertising to sales volume ratio), cost outdoor / in ratio (cost of outdoor advertising to number of inquiries ratio), budget allocated for the outdoor advertising/ budget spent., percentage of outdoor campaigns that fail to start/end in due time, number of photo reports actually received to number of photo reports planned, sov outdoor /competitors sov outdoor ratio, sov outdoor /som ratio (share of voice/share of market), sm2/ig ratio (square meters of outdoor space purchased to inquiries growth ratio), percentage of mistakes that may be perceived by customers as mistakes..
Download a trial version of Outdoor Advertising Evaluation Balanced Scoreboard or purchase a full version online.